A simple test to determine your stomach acid levels is to eat a beet and then check the color of your pee. If you have pink pee, that means that your stomach acid is too weak and if it is clear, you have sufficient stomach acid. Your stomach needs a pH of 2 (battery acid pH) to break down proteins and to make vitamin B-12 available. If you don’t make enough stomach acid, then you don’t digest proteins well and they go into your small intestine as protein fragments instead of amino acids. This can cause problems, one of the most common being leaky gut. One cause of leaky gut is when the gluten particles actually poke holes in the small intestine, allowing undigested food particles to get into the bloodstream. And then, on top of your chances of getting leaky gut, if you don’t absorb enough B12, you may become fatigued far more easily. So not only will your stomach be developing problems, you’ll just be plain tired all the time! But there’s no reason to fear! Leave it to the beautiful beet to give you information on your stomach acid. It’s like a litmus paper strip, only it shows up in your pee. 1. Drink 2 glasses of water 15-30 minutes before eating – This gives your stomach a water jacket, per-se and protects it from the acid. According to Ayurveda, the stomach will respond accordingly and increase the amount of hydrochloric acid released. 2. Drink a large sip of organic apple cider vinegar – Do this before your meal to help with lowering the stomach acidity. Roughly 1 Tbs. in a glass of water. Try these two tricks and then see if your pee is still pink when you eat the next beet. May Show Anti-Cancer Properties – Beets have helped people with solid tumors achieve remission in a few case studies. Patients drank beet powder in water and the beet powder regimen caused tumor shrinkage. Beet juice itself is a powerhouse of nutrients and antioxidants, folate, potassium and its signature antioxidant, betalain. Golden beets have their own version of betalain, which shows up as a different compound on chromatography analysis. One Of The Top Health Foods – Beets are “in” to eat this year. Beets were one of the top 5 foods at the Summer Fancy Food Show this June. Must be because they help with libido, increasing digestion, lowering blood pressure and can be made into tasty juices (see recipes on the blog) and shredded raw into salads or grilled for a vegetarian option at a BBQ. There is also an intriguing recipe for beet burgers made with leftover beet pulp from juicing on the blog. 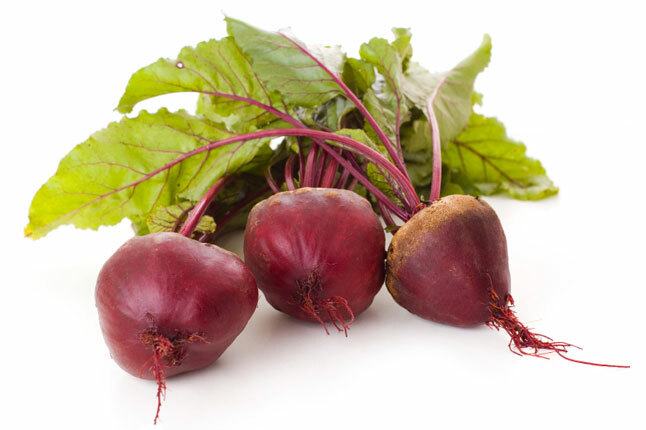 Beets or beet powder can also help teenagers struggling with acne. Beets Make The Dogs (And You) “Regular” – I once made Beet Cake, a lovely white cake recipe for my brother’s birthday cake. One of his five dogs, Roy, jumped up on the counter while the humans were sleeping and ate half the beet cake. We knew which dog it was, because Roy had to go outside four times that night. So if you are traveling or are feeling a little slow, beets can help you out on that front as well. Visually Appealing – Beets are pretty as well. You may be able to find chioggia beets, which are striped, or golden beets at a farmer’s market, or you can grow your own. They love to grow right up past the first few frosts, so plant a few rows now for fall.